Avec le soutien du Doha Film Institute, de l’Aide aux Cinémas du Monde, de l’Enjaaz Film Fund, de l’Arab Fund for Arts and Culture et du Sanad Film Fund. 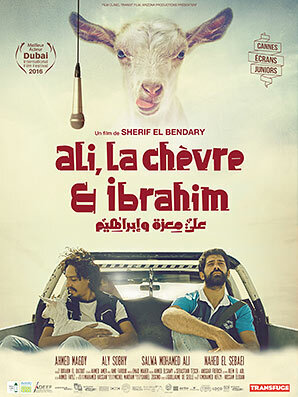 Ali refuses to accept the death of his girlfriend, Nada, and believes her soul has been reincarnated in a goat. His mother drags him to a healer who gives Ali stones to throw into the sea on the coast of Egypt to reverse the ‘curse’. At the healer’s place, he meets Ibrahim, a depressed sound engineer who hears voices he cannot decipher. Ali, his goat and Ibrahim embark on a journey across Egypt, eventually forming a strong friendship, but Ali feels betrayed when Ibrahim tries to drown himself. He returns to Cairo and is attacked by thugs. Ibrahim finally forces Ali to meet Nada’s parents so that his emotional wounds can be healed. ALI LA CHÈVRE ET IBRAHIM de Sherif El Bendary – En salles le 07.06.2017 from V.O. on Vimeo.